Findings led by Rensselaer Polytechnic Institute Researchers ; Published in the Astrophysical Journal. 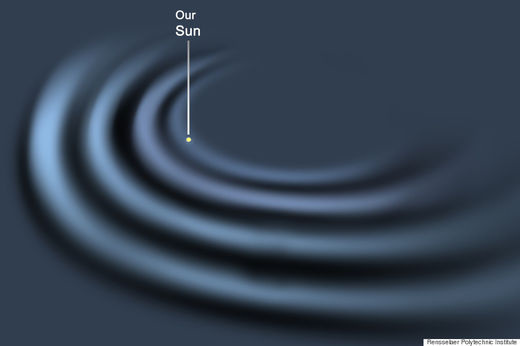 Illustration showing the density of light in the Milky Way. Illustration showing how regions of low density may actually be evidence of a corrugated structure. 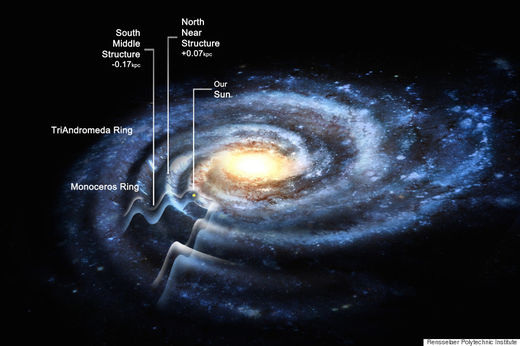 In an email to The Huffington Post, Dr. Jay M. Pasachoff, professor of astronomy at Williams College in Williamstown, Mass., called it "exciting" and offered his own interpretation: "Our sun has been thought to be about two-thirds of the way out in our Milky Way Galaxy. Now we learn that we are really halfway out. Our galaxy extends further out than we had realized. If you think of our galaxy as a 9-inch dinner plate with us two-thirds of the way out, unable to see far through the plate's disk, we now learn that the plate was really 12 inches across." Eat it up, astronomy buffs! And if you want another helping (and have 20 minutes to spare), you can watch Dr. Newberg explain the finding in the video below.